Spectralis - Haulage and Excavation Inc.
Spectralis Haulage & Excavation Inc. is excited to announce a new business operating in the South Western Ontario. Our Company mission is to provide our clients with safe, timely and cost efficient service, delivered by professional and experienced drivers. Our team has many decades of Industry experience coupled with an impeccable record of safe driving history! We can also offer assistance with jobsite planning as we have experience in earth construction and transportation. Our fleet consists of 6 Tri-axle Dump trucks + 3 Ponies. We also offer dispatch services for numerous owner/operators. As an additional service we offer a Dumpsite service for Clean Fill only. 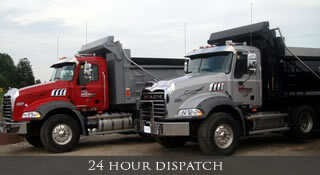 In December 2011 Spectralis Haulage & Excavation Inc. acquired the assets of Guelph Power Sweeping. Continuing the services that have been benefiting the Tri Cities and surrounding regions for over twenty years, we will be completing jobs that focus mainly on street sweeping and parking lot maintenance but will also include line marking, asphalt milling and much more. For a full list of services and how to contact visit our website at www.guelphpowersweeping.com. All rates and pricing are available upon request and please be assured that no job is too big or small! Our top priority is to deliver our motto simply stated as "Our Service Your Satisfaction".